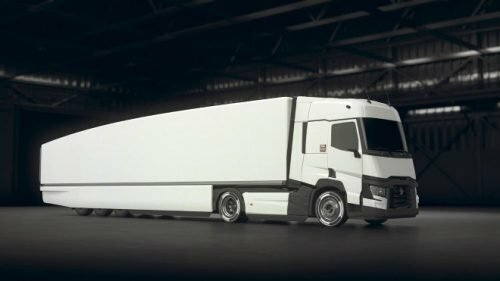 Renault Trucks is continuing its research into improving the energy efficiency of diesel trucks with Optifuel Lab 3, the laboratory vehicle developed as part of the FALCON (Flexible & Aerodynamic Truck for Low CONsumption) collaborative project. Optifuel Lab 3 combines technologies relating to aerodynamics, rolling resistance, driver assistance, energy management and the powertrain and aims to reduce fuel consumption by 13% on a complete tractor-trailer combination. The aim of Optifuel Lab 3 is to demonstrate a 13% reduction in fuel consumption compared with a standard Range T truck and trailer. It brings together innovative technologies developed by a consortium of partners comprising Renault Trucks, including Faurecia, Michelin, Total, FRUEHAUF, Wezzoo, Benomad, Styl’Monde, Polyrim, Enogia, the IFP Énergies nouvelles, the École centrale de Lyon (LMFA) and the IFSTTAR, the French Institute of Science and Technology for Transport, Development and Networks (Transport and Environment Laboratory (LTE) and Laboratory Ergonomics and Cognitive Sciences applied to Transport (LESCOT)). Optifuel Lab 3’s technological developments will focus on optimised tractor semi-trailer combination aerodynamics, connected low-rolling-resistance tyres, predictive energy-saving driving assistance and energy management functions, as well as an improved powertrain. The aim is to significantly improve the aerodynamics of the combination to considerably reduce fuel consumption, particularly by introducing a variable-geometry trailer. Developed by FRUEHAUF in collaboration with Styl’Monde for the fairings, this ‘adaptive’ trailer is intended to automatically take on an optimised shape by using empty loading space thanks to a built-in control and command system and sensors. The tractor’s aerodynamics will also be improved by replacing wing mirrors with cameras, and a newly-designed A-pillar in the cab based on a PhD thesis from the Fluid and Acoustic Mechanics Laboratory at the École Centrale de Lyon. Airflow will also be optimised by extending the front end and door and streamlining wheel arches. Side fairings will also be bigger and made from flexible material by Polyrim, like the side deflector extensions to provide continuity between the truck and trailer. On long-haul trips, tyre rolling resistance accounts for around 25% of fuel consumption. Michelin will develop tyres with low rolling resistance for the laboratory vehicle by integrating innovative technologies derived from research projects. Renault Trucks and Michelin will also use data obtained by sensors installed in the connected tyres. Navigation and traffic (Benomad), meteorological (Wezzoo), and tyre (Michelin) data from Optifuel Lab 3 will be used by optimised predictive speed and cooling system controllers. This latest system will be equipped with new actuators to maximise energy savings. These developments will be accompanied by a new Human-Machine Interface specially developed in partnership with the IFSTTAR to provide the driver with an energy-saving, efficient and user-friendly driver assistance system. Alternator control will be made even more intelligent in order to optimise the balance between electrical energy production and internal-combustion engine fuel consumption. For Optifuel Lab 3, extensive work will also be carried out on the dual battery device with expected significant weight reduction and improved cold-start performance for the start battery and increased capacity and life time for the living battery. The whole powertrain will benefit from new-generation low-viscosity lubricants developed by Total for reduced friction. In addition, performance studies will be carried out on test benches and integration studies will be conducted for two types of waste heat recovery system architecture based on Rankine’s thermodynamic cycle. The research is being carried out jointly by Renault Trucks, Faurecia, IFP Energies nouvelles and Enogia. Renault Trucks and its partners are aiming for a 13% reduction in fuel consumption on a typical long-haul trip. Optifuel Lab 3 will conduct its first on-road tests in 2019 and determine consumption savings assessments in 2020.